Saudi imprisoned blogger, Raif Badawi, was awarded the 2015 Sakharov Prize for Freedom of Thought. Standing in front of the empty chair where he should have sat, his wife, Ensaf Haidar, held his picture up after making a very moving acceptance speech on his behalf. The European parliament website gives a detailed account of this emotional ceremony: “Raif Badawi was brave enough to raise his voice and say no to their barbarity. That is why they flogged him," said Ensaf Haidar, the wife of jailed Saudi human rights activist Raif Badawi, accepting the 2015 Sakharov Prize for Freedom of Thought on his behalf in Strasbourg on Wednesday 16 December. 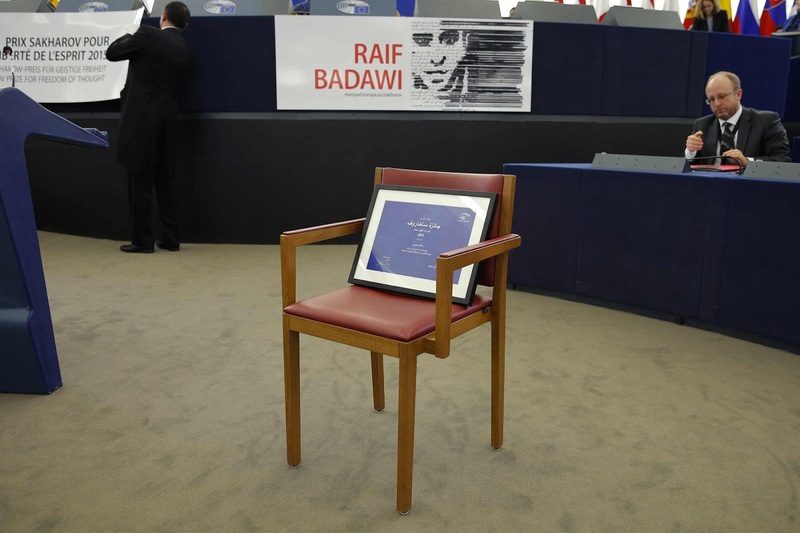 Badawi was honored by the European Parliament for his fight for freedom of speech and thought in Saudi Arabia. She continued: "He is just a thinker who refused to be part of the herd following clerics living outside of time and governing by unjust and tyrannical laws." Haidar thanked the European Parliament for the award: "Awarding the Sakharov Prize to Raif Badawi is historic. It is, Mr President, an act of bravery by you and by all those who voted for Raif." "Badawi has become a symbol and an inspiration for all those fighting for fundamental rights in the region and beyond," said EP President Martin Schulz during the ceremony. "Despite great risk, as a blogger he has bravely endeavored to foster free thought and exercised his right to freedom of expression filling a vacuum left by the lack of a free press in his country." Schulz called on King Salman of Saudi Arabia to pardon the blogger immediately and release him unconditionally. He urged Saudi authorities "to put an end to the systematic crackdown on peaceful expression", referring to people such as Waleed Abu al-Khair, Abdulkarim Al-Khodr, Ashraf Fayadh and Ali Mohammed al-Nimr. He was warmly applauded when he called for the release of Mohammed al-Nimr who was sentenced to death. The EP President reminded that the country had been elected to the UN Human Rights Council. "We are prepared for dialogue on human rights" but "no terror, no inhumane penal system will prevent us from fighting for human rights," Schulz told Haidar. "No security argument, no weapons deal or oil money may deter us." Schulz also welcomed representatives from the 2015 Sakharov Prize finalist present in the public: Maria-Alejandra Aristeguieta-Alvarez representing the Democratic Opposition of Venezuela and Olga Shorina, the Executive Director of the Boris Nemtsov Foundation for Freedom in Germany. Badawi is a blogger and an advocate of freedom of thought and expression who was sentenced to ten years in prison, 1,000 lashes and a hefty fine for hosting online posts that were considered blasphemous by Saudi authorities on his website promoting a social, political and religious debate. His first series of public lashes in January 2015 provoked international outcry and also sparked concerns about his health, which so far have prevented further floggings, but Badawi still remains in prison and has recently been placed in isolation."